In this editorial I want to return to a topic that both interests me and many reef keepers – trace elements and nutrients. It is a topic of considerable debate for both scientists and amateurs alike. It is at the heart of discussions about trace element additions, salt mixes, feeding, skimmers, and algae scrubbers to name just a few. What I have to say here, however, is essentially anecdotal. In other words, my very tentative ideas are based simply on my observations of my own reef tanks, and sometimes that of others. I don’t want to minimize the value of observations made by an experienced reefkeeper, but only to make it clear that anecdotal information by its very nature is subject to error. When observing a complex biotopes there are always too many variables for the observer to be sure about any apparent causal relationship. Bottom line, I could be all wrong. With that noted, let’s move on. 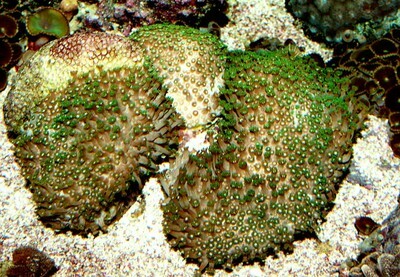 In several editorials back I mentioned problems with certain hermatypic corals, especially Acropora spp., dying back. After some measurements to correct a too high specific gravity, and the discovery that nitrates and more importantly orthophosphates had gotten too high, I introduced Caulerpa spp. into my 40-gallon refugium and improved the skimmer on my system. As you can see from the picture of this refugium, I’m able to grow macroalgae very fast. The refugium is directly under a 250 watt MH bulb. I’m able to harvest about a 5-gallon pail full of wet macroalgae every two weeks. Furthermore, I now feed every other day, instead of every day. The results of these improvements – if that is what they are – in the way I manage my reef tank is a lowering of nutrient levels to a concentration below the resolution level of my professional Hach test kits. However, things are not as clear cut as they appear to be. The author’s Alveopora sp showing signs of dying back, after several years of growth. A shot of a section of the author’s reef tank, showing the orange Montipora sp., which grew from a small fragment. First, the good news: Small polyp scleractinian (SPS) corals have undergone an enormous growth spurt, with even corals that were on the verge of death returning to vigorous growth. For example, a small quarter size fragment of orange Montipora sp. given to me by Greg Schiemer that had for months not grown, began to grow very rapidly and, as can be seen from the photograph, has grown into a beautiful large specimen. Once again, I’m back to having to prune corals weekly to keep them from stinging or shading other corals. However, this is one of the annoyances and joys of successful reef keeping. Now the bad news: My green Alveopora sp. which had doubled in size during the period when my nutrient level was too high for SPS corals is now showing signs of receding. This is not the first time I’ve observed a situation like this. Years ago, I had a flourishing Goniopora sp. that for several years was growing well, but went into a decline after I vastly improved skimming to make its reef tank more hospitable for SPS corals. This, of course raises a number of questions. Do corals like Alveopora and Goniopora require a relatively high nutrient level, making them incompatible with SPS corals? Does a high nutrient concentration have anything to do with success with Alveopora and Goniopora? It is entirely possible that the heavy growth and exporting of nutrients and certain trace elements via algae scrubbing by macro-algae refugiums and protein skimming starves these large polyp scleractinian (LPS) corals. If skimming and algae scrubbing removes trace elements needed by these LPS corals, which trace elements are we talking about. Skimming removes in its skimmate, more than anything else, phytoplankton. In the process of photosynthesis, phytoplankton consumes trace elements and nutrients. 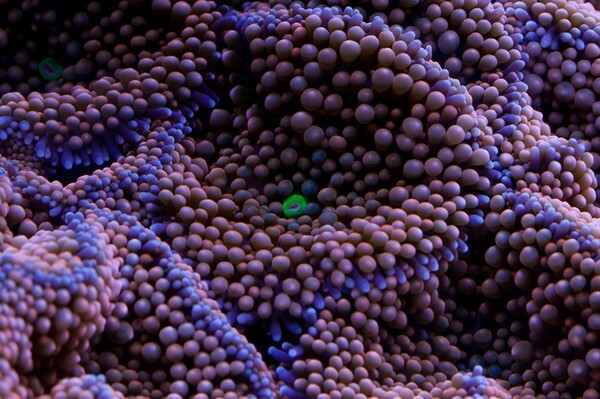 Do the LPS corals, mentioned above, need to feed on phytoplankton or what phytoplankton removes from the water column when it is skimmed out? Questions, questions, questions. 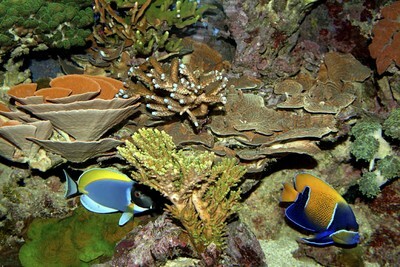 Causal relationships in a reef tank are complex, andanswers come slowly, but they do come. The continual search for answers is why we here.